Hi Jeff! Do you have a website? Instant fan. Love the Star Wars series here.... Thank you for sharing! 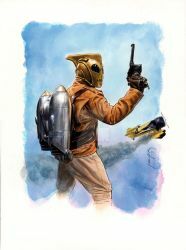 I so wanna get some prints of your Kinkade/Star Wars mashups. You're on to something here with this Kinkade thing. Did you know there is already ya Kinkade Disney tie-in? You should get on the phone ASAP and make this a licensed product! do you do any tutorials? I would love to learn about your technique.